Biogeochemical processes on exposed pyrite ores result in extremely high levels of sulfuric acid at these locations. Acidophiles that thrive in these conditions must overcome significant challenges, including an environment with proton concentrations at pH 3 or below. 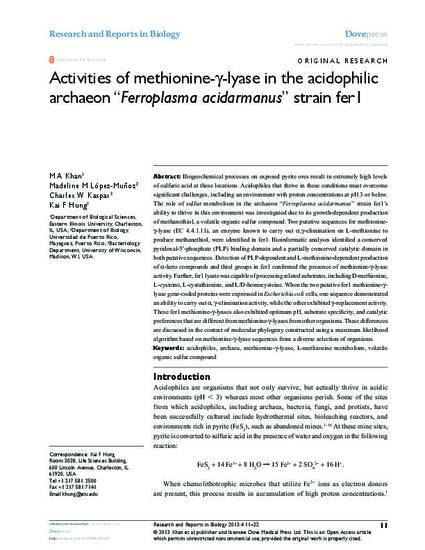 The role of sulfur metabolism in the archaeon “Ferroplasma acidarmanus” strain fer1’s ability to thrive in this environment was investigated due to its growth-dependent production of methanethiol, a volatile organic sulfur compound. Two putative sequences for methionine- γ-lyase (EC 4.4.1.11), an enzyme known to carry out α,γ-elimination on L-methionine to produce methanethiol, were identified in fer1. Bioinformatic analyses identified a conserved pyridoxal-5′-phosphate (PLP) binding domain and a partially conserved catalytic domain in both putative sequences. Detection of PLP-dependent and L-methionine-dependent production of α-keto compounds and thiol groups in fer1 confirmed the presence of methionine-γ-lyase activity. Further, fer1 lysate was capable of processing related substrates, including D-methionine, L-cysteine, L-cystathionine, and L/D-homocysteine. When the two putative fer1 methionine-γ- lyase gene-coded proteins were expressed in Escherichia coli cells, one sequence demonstrated an ability to carry out α, γ-elimination activity, while the other exhibited γ-replacement activity. These fer1 methionine-γ-lyases also exhibited optimum pH, substrate specificity, and catalytic preferences that are different from methionine-γ-lyases from other organisms. These differences are discussed in the context of molecular phylogeny constructed using a maximum likelihood algorithm based on methionine-γ-lyase sequences from a diverse selection of organisms.